Like many, I’ve got my webhosting with Godaddy. I quite like them, as they’re cheap, you can host multiple websites very easily and they provide you with a really good level of control. My only issue with them is that you don’t have rsync functionality to backup. I much prefer rsync for all of my backups, as the incremental process is so much faster than a full ftp backup. I was having a look at this problem this morning when I found this page here. It outlines a way to get a copy of rsync onto godaddy for use. Unfortunately, it was a bit thin on details, so I thought I’d expound them a bit more here, so that people from the future may be able to learn from what I’ve found. Godaddy’s hosting is currently using CentOS 5.5, so you’ll need to find a copy of rsync which is compatible with that OS. Version 2.6.8 currently works. You can find it here. This is an RPM package, so it’s not easy to open. Grab 7-zip (freeware) program, which can read it just fine. Go to the ‘bin’ directory, and copy the ‘rsync’ executable. Copy it to Godaddy. I had troubles when I copied it. For some reason, my FTP program copied it in ASCII mode, which corrupted it. I had to manually set my FTP program to transfer in Binary mode. Make sure the filesize comes out at 313688 bytes. Once it’s on Godaddy, log in with SSH. SSH isn’t automatic with Godaddy. You need to go to your hosting control panel and turn it on. Create a new directory called ‘bin’. That’s all you need to do! This then is the command I use to backup my websites. This entry was posted in computing and tagged godaddy, rsync on November 28, 2011 by David. 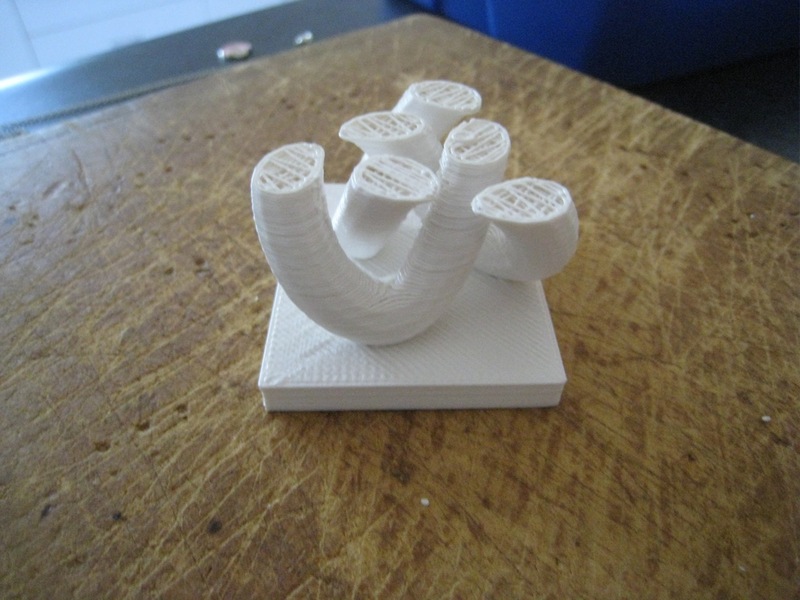 I was printing out the 3D-knot as a bit of a demonstration / vanity piece. However, when the print was at 77%, I accidentally disconnected the USB cable! Unfortunately, the cable I have at the moment isn’t long enough to reach my printer, so I use a USB-extension cable which is a bit prone to coming apart. It was looking really good, with only a little bit of lifting up at one corner. Add in a few extra shells on first layer only. Give the bed a really good clean. There were a few grease marks causing the filament to stick badly, which would then start off the lift-off. Okay, I’m really going to have a good look at SD card printing now. 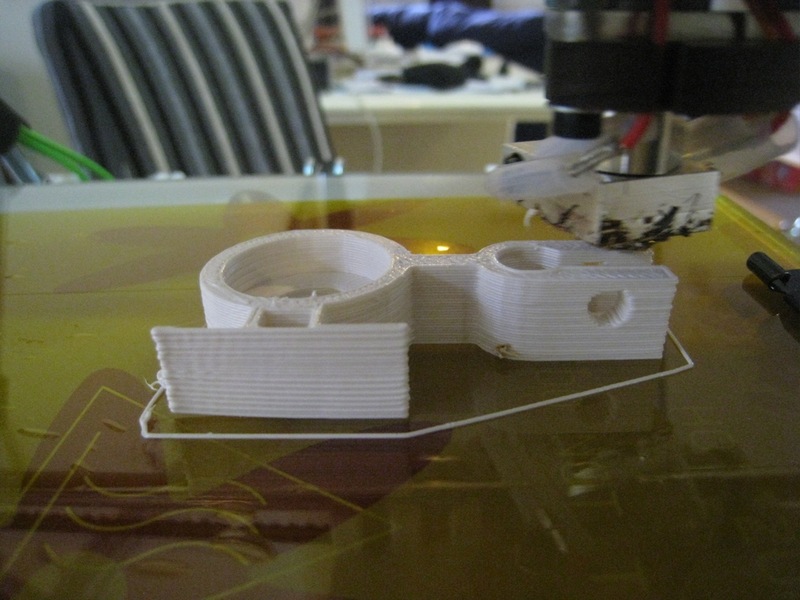 This entry was posted in reprap and tagged print, video on November 27, 2011 by David. 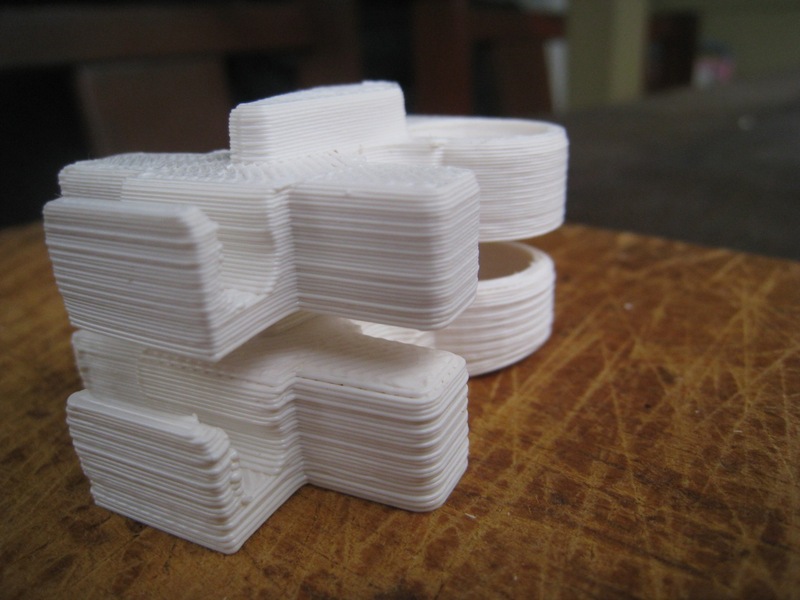 I’ve had the suspicion for a while that the ‘extra shells’ setting in SFact was causing a few of my prints to print out sub-optimally. Now, I’ve got some proof. Some 608 bearings arrived during the week, so I thought that I’d print out some Z-axis stabilisers. I’ve seen that the walls on my prints have a bit of ‘wobble’ in them. This wobble isn’t on the Y-axis, it’s only confined to the X. I’m thinking that the Z-axis is moving a bit, creating the X-axis wobble. There was a clear gap between the inside wall and the outside wall of the bearing holder. This gap went all the way down. I think what’s happened is that SFact creates extra shells. However, once these shells are created, there isn’t enough space left for SFact to then do some infill. To try and combat the problem, I went into SFact, and removed the extra shells on all layers except the base layer. I then tried out the same print again, and it came out perfect. At the moment, I’m wondering why SFact even has the ‘extra shells’ feature at all. Just how necessary is it? With another print of the earbud holders, I tried removing the extra shell on the base layer as well, but I ended up having trouble with my first layer. 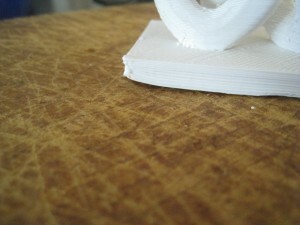 Once the infill started, the head would sometimes pick up the outside line, tearing it off the bed. Adding back in one extra shell fixed this problem. Once two Z-axis stabilisers were finished, I fitted bearings in them. (They just pushed in with only a moderate amount of force. Perfect sizing.) I then mounted one on the X-motor side. (The one on the X-idler side will have to wait for some endstop fiddling). I then printed out another earbud holder for comparison. It came out beautifully. The combination of the Daily Branch of SFact, Marlin 1.0 Beta, and the Z-stabilisers is making my prints look absolutely fantastic. This part needed absolutely no clean-up at all. This is the way it came out of the printer. 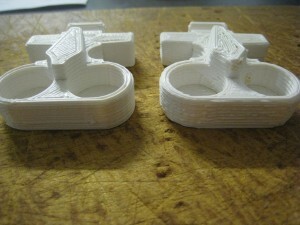 Before Z-stabiliser on left. After Z-stabiliser on right. Notice particularly the fill goes right to the edges much better. In related news, the ooze problem seems to have disappeared. Have a look at the photo below. The vertical hole has printed perfectly, no strings at all. I’ve got my suspicions as to what’s fixed the problem, but I’ll leave that for another post. 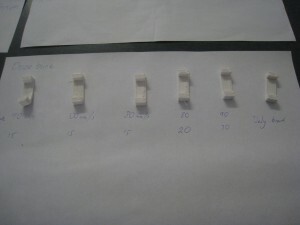 This entry was posted in reprap and tagged sfact, stabilisers on November 26, 2011 by David. Okay, I’m a bit sick of fighting ooze at the moment (see last post for more details), so I thought I’d get in and print some useful objects. 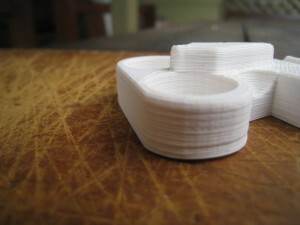 When browsing Thingiverse the other day, I saw this design for a holder for Apple earphones. 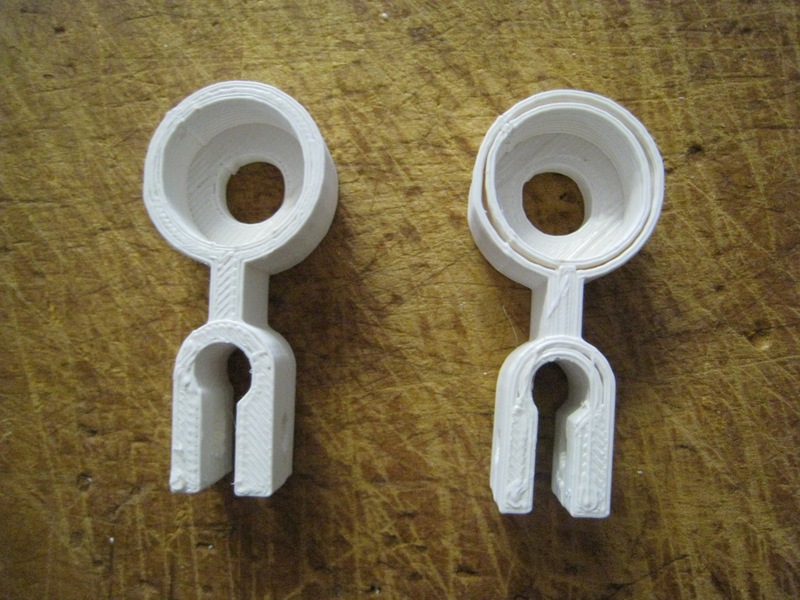 I thought that these might make ‘stocking stuffers’, and a good answer to the question ‘Well, what can you make with a 3D printer?’ that you often get asked. Not willing to just print something out (heaven forbid), I used the opportunity to also give Slic3r a try. 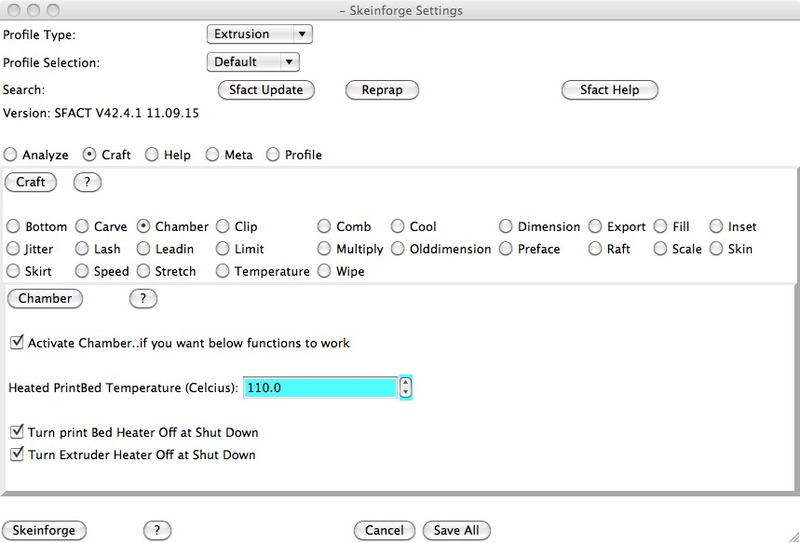 Slic3r is an alternative skeining program, different from Skeinforge and SFact. Unlike SFact, which basically works as a ‘plug-in’ to Pronterface, Slic3r is a stand-alone program. I’m not sure what advantages this gives, but it’s extremely fast to skein, which is probably due to running natively vs running interpreted Python code. One of the supposed strength’s of Slic3r is in thin layers, so I thought I’d try something a little different. 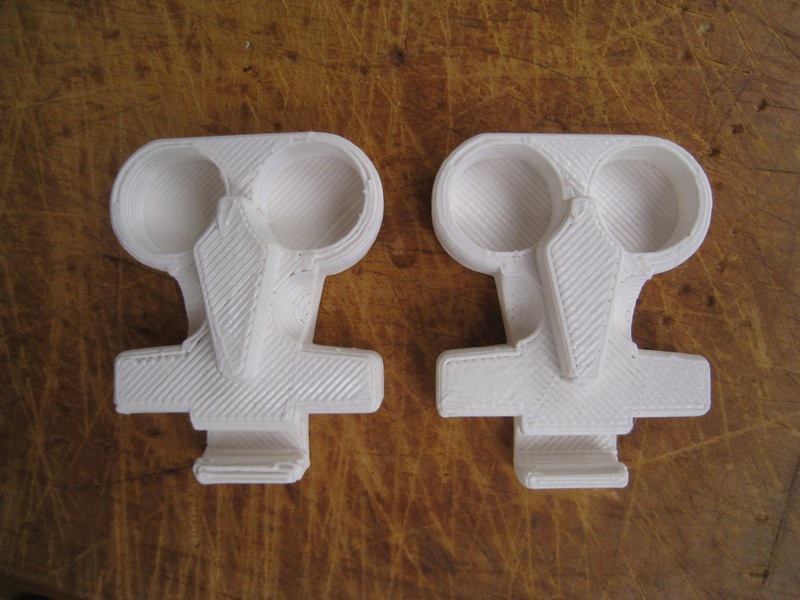 I printed up two earbud holders. 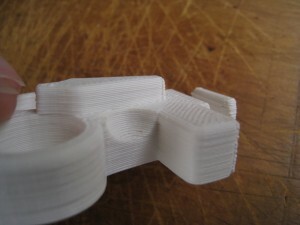 One, using Slic3r, would be at 0.2mm layers, but printed at 60mm/s. The other, using SFact, would use 0.4mm layers, and print at 30mm/s. So they should have the same printing time, but each have a different area of focus. 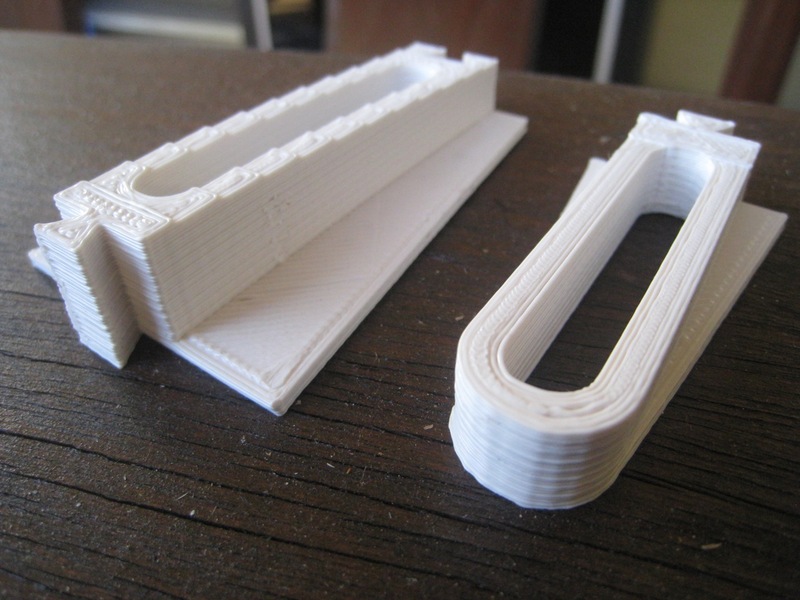 Slic3r’s output is on the right, SFact on the left. I’m not totally impressed with Slic3r’s results. It’s clearly missing a lot of the fine tuning which has gone into SFact. 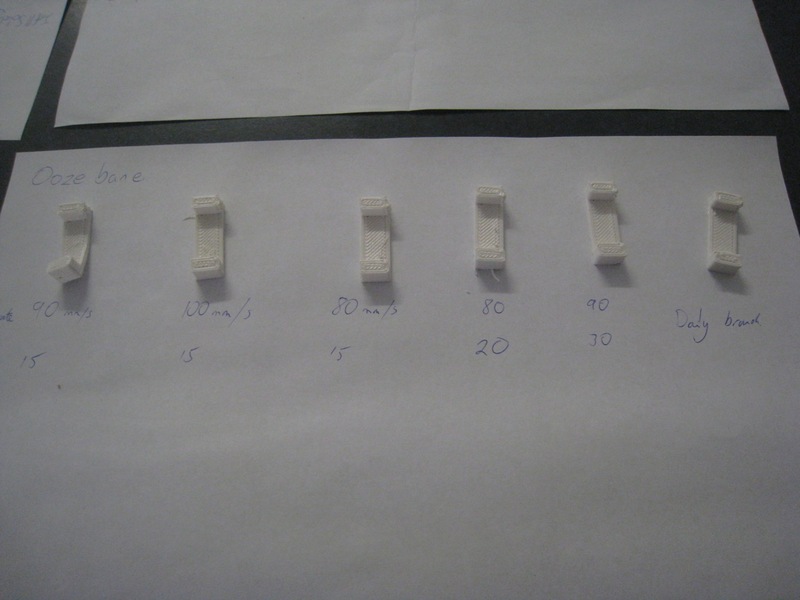 I think that the 0.2mm layer was just a bit too thin, and the walls came out a bit unevenly. I think that it’ll definitely be worth keeping an eye on Slic3r. It’s only very new, but doing pretty well so far. This entry was posted in reprap and tagged sfact, slic3r on November 24, 2011 by David. 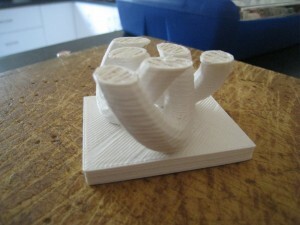 Unfortunately, I didn’t have much luck getting help for my ooze problem in the Reprap forums. 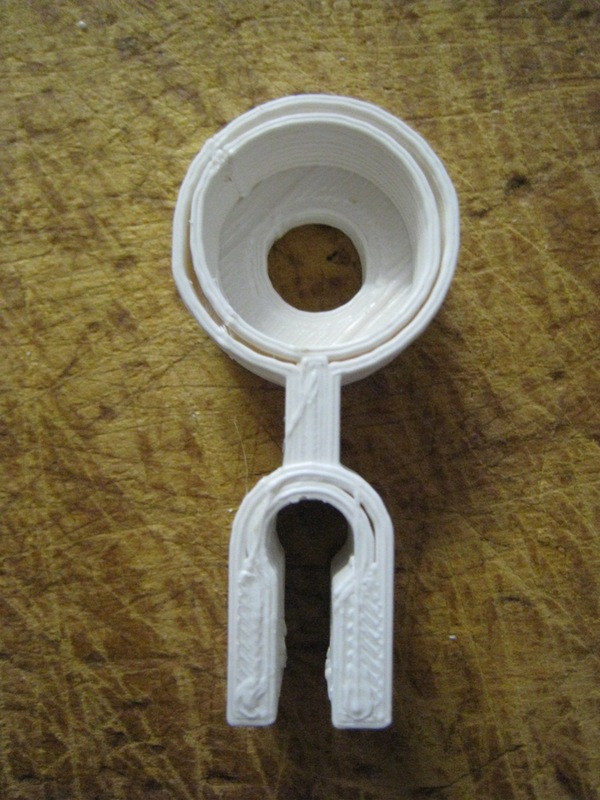 The only respondent suggested that the best way to fight it is to replace the hot-end, with a J-head nozzle. While I do have a J-head spare, I’m not quite willing to give up on the Budasnozzle yet. I thought I’d sit down with the ‘daily branch’ version of SFact (which has more retraction-related settings), and battle my way through the various settings, see what the effects are. 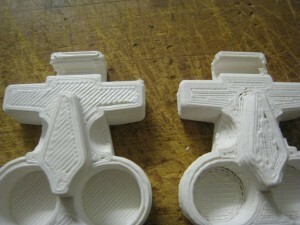 Result – Really terrible – filament everywhere. Did I save the second one correctly before skeining? v4 – retry v2 again, slow down filament speed to 30mm/s just to get a better idea of what’s happening. 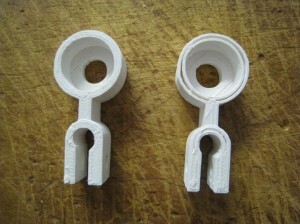 Result – The same as V2. Notice that the Z-axis bars are moving around a bit. Probably need to tighten up X-axis bars again. Maybe print some Z-stabilisers. Result – Okay, it looks like the ‘restart extra distance’ is causing a lot of the blobbing. It’s the extra filament that gets fed into the extruder before starting the next section. Take this back to 0, I think. v6 – Restart Extra distance at zero. Result – Much better. Internal blobs lowest of all prints. External still higher than default settings. Can you set a negative Restart extra distance? v7 – Restart Extra distance at -1.5. While I wasn’t successful in removing the ooze, I’d still call tonight a success. 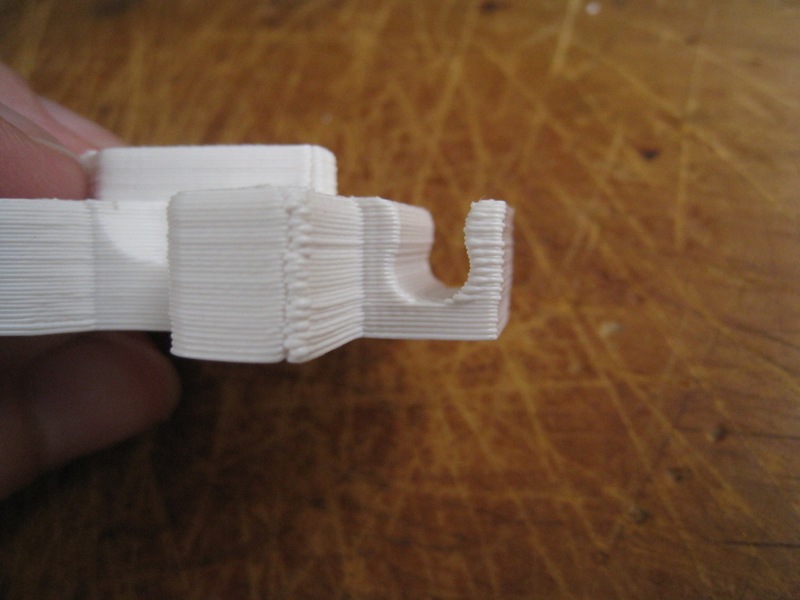 I’ve learnt a lot about SFact’s retraction settings, and feel like I have more control over the machine, in general. 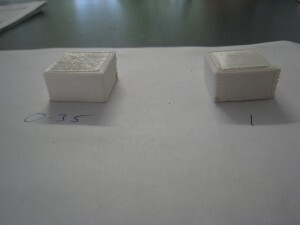 This entry was posted in reprap and tagged calibration, ooze on November 23, 2011 by David. 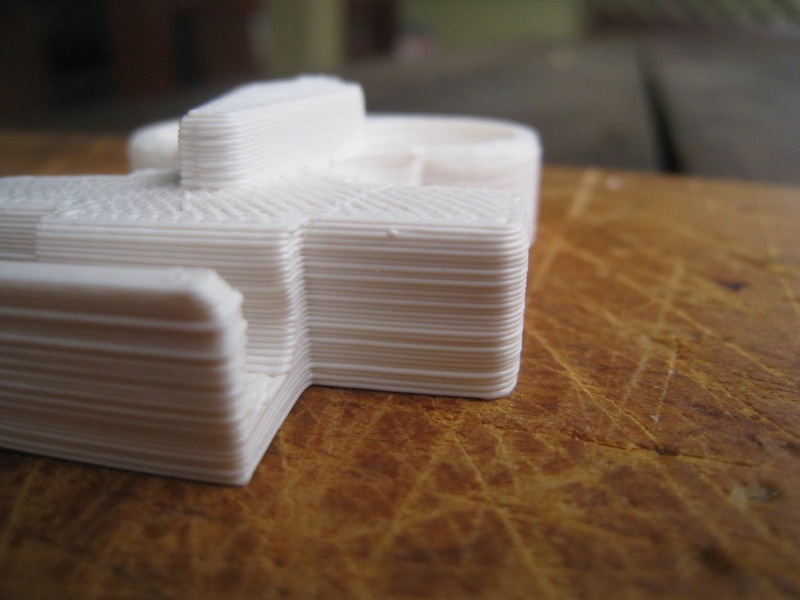 While my Prusa is printing fairly well, there’s still a lot of room for improvement. My calibration methodology so far has involved just fixing the glaring problems, rather than going through a systematic calibration process and optimising the printer’s performance at every step. The top two tasks on my ‘to do’ list are calibration related, so it makes sense to tackle them all in one go. Seeing the success that Julian has had with his calibrations has inspired me to sit down and go through the calibration profile described in the wiki. As you can see from the photos, they all turned out great, with no issues at all of the extruder tip plowing into the previously deposited layer. 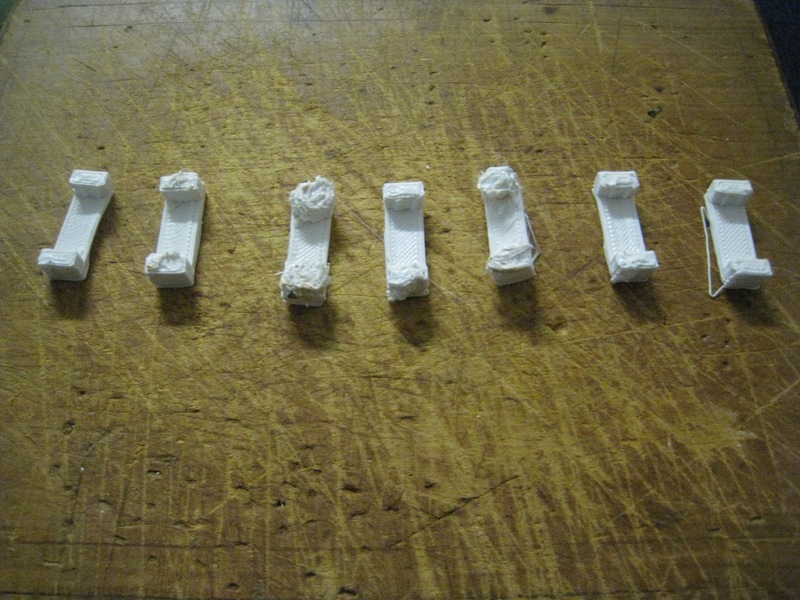 SFact is obviously doing a really good job in controlling the extrusion for all these different heights. 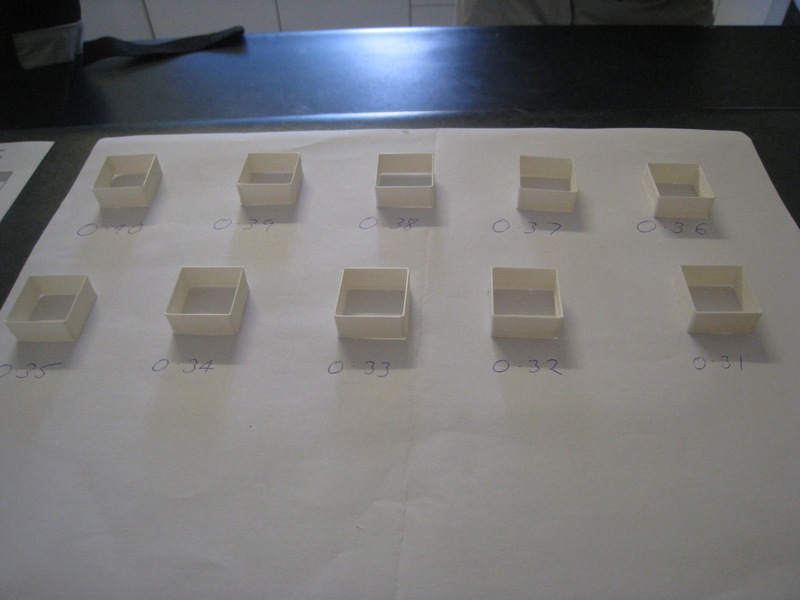 As the layer thickness decreases, the fineness of the layers becomes extremely apparent. 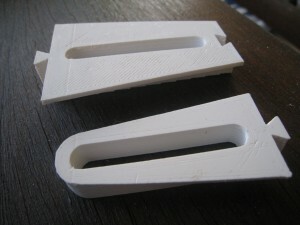 The one on the left is 0.4mm layer thickness, and the one on the right is 0.31mm. Stage two was looking at infill. 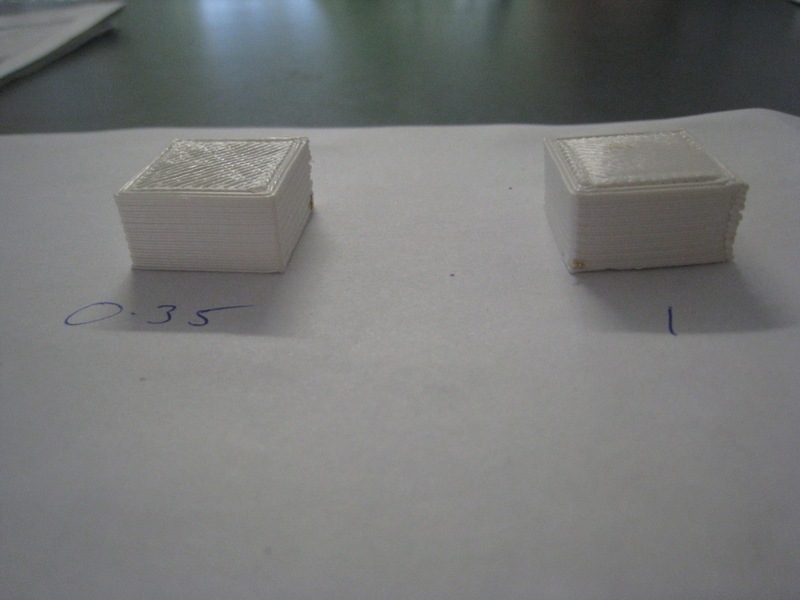 The first one I ran, I only had the infill solidity at 0.35. It turned out fine, perfectly flat. The second one I turned up the infill solidity to where it was meant to be: 1.0. In this one, there was a noticeable convexity to the top of the print. It was only minor, but quite noticeable. 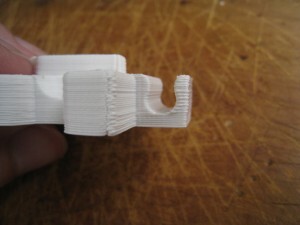 However, I couldn’t find the setting in SFact that ‘s meant to fix the issue – ‘Infill width over thickness’. This must be one of the settings that been taken out with the move from Skeinforge to SFact. 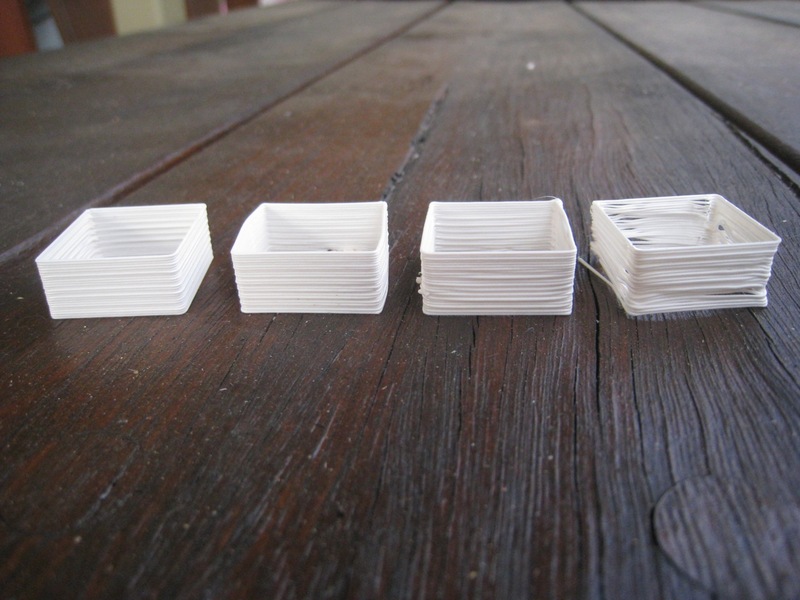 Maybe the best way to adjust this these days is by changing the ‘Filament Packing Density’ – I’ll have to check. Since there wasn’t anything more I could do here, I moved onto a third test – Oozing. Oozing has been the biggest issue with my printer since I started printing. There’s two main issues that I have. The first is at the ‘uplift corner’. I always get a bulge at the corner where the printer stops to lift up the layer. 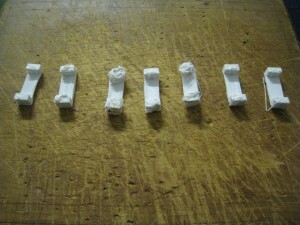 The lifting up process causes the print to pause for a second. The ‘dribble’ from the nozzle at that point always creates a slight bulge. The second issue is a more typical ooze issue – ‘fly aways’ at the start and end of exposed ‘towers’. This can be seen very clearly in some of my earlier prints – seen here. These problems aren’t too bad. The results can be cleaned up with a knife fairly easily, but better not to have the problem in the first place. Unfortunately, I wasn’t able to make any real headway today into this problem. SFact has two main ooze-related settings – ‘Oozerate’ and ‘Filament Retraction Speed’. I fiddled with these settings, as can be seen the above photo, but without any real improvement. As an additional step, I went and downloaded the ‘daily branch’ version of SFact. This has a lot more ooze and retraction-related settings. I tried a couple of test prints, but again, had no significant success. I’ll keep trying with some additional settings, but I think I’ll have to go to the forums’ and ask for some help there, get the expert’s opinion. This entry was posted in reprap and tagged calibration on November 20, 2011 by David. As I commented in Julian’s blog, it’s interesting to see the difference in quality that he gets between the different speeds. I haven’t noticed too much of a difference myself, but I put that more down to my lack of calibration than anything else. I thought that I’d replicate his three-speed experiment to compare and contrast the results. I used the ‘single-wall calibration cube’ as my test object. The four speeds were: 30, 45, 60 and 90 mm/s. They’re all looking fairly good up until the 90mm/s one. The main problem there was that the filament was going down so fast that it didn’t give the layer below a chance to cool down before starting the next layer. If I’d had some active cooling, or a larger object, I think it’d have looked great. 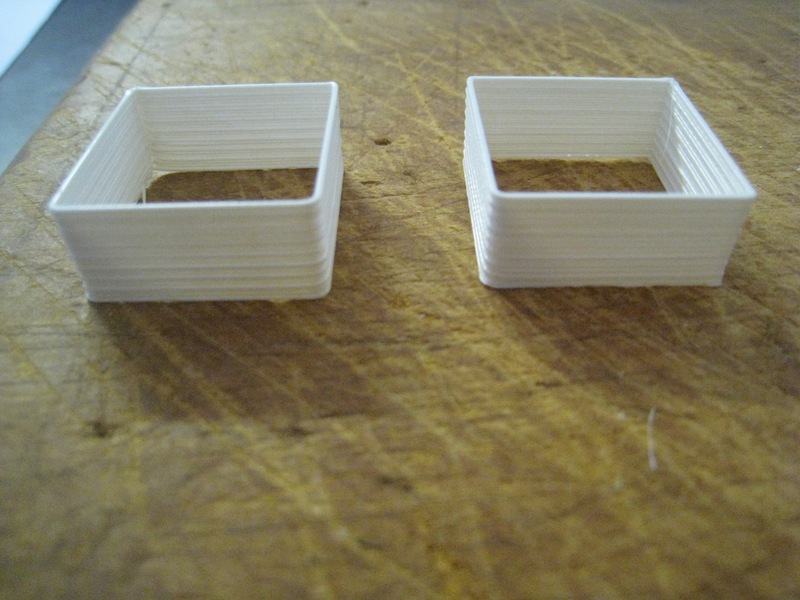 I didn’t notice until I’d finished doing these cubes, but my X-Axis belt was slightly loose. I think I could have got them looking even better! 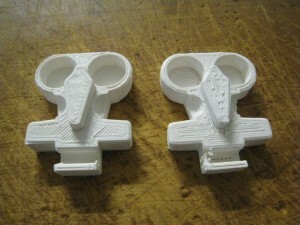 This entry was posted in reprap and tagged calibration, speed on November 18, 2011 by David. Finally finished printing the spool. Printed out the last couple of bits tonight, and assembled it this afternoon. The most difficult part was the support arm that sits on the frame, the spindle. In its standard orientation, it wouldn’t fit onto my print area. I had to load it up into EasyFit, and rotate it 90 degrees. Currently my X-axis only has 155mm of travel, while Y has 175mm. Once rotated the piece fit on fine. However, I printed out the wrong one! I printed out this spindle, but it was too narrow, causing the spool to flop around. I had to print out the spindle from this page. It’s a bit tight, but should loosen up with use (and maybe some sandpaper.) I also printed up a filament guide. Here’s the assembled spool. Looks great, and will keep my work-area a bit more tidy. As you can see, I’ve almost finished off my first roll of filament! And a video of the spindle being printed. This entry was posted in reprap and tagged spool, video on November 18, 2011 by David. Well, that was easy. Only a minute of searching the Reprap forums yielded the solution to this problem. To auto-shutdown the hotend and heatbed after a print just go to the ‘chamber’ tab in SFact. Turn chamber on, then check the ‘turn off at shut down’ buttons. 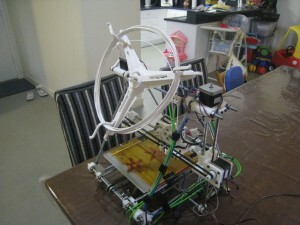 This entry was posted in reprap and tagged sfact on November 16, 2011 by David. Okay, so that title was pretty contrived. 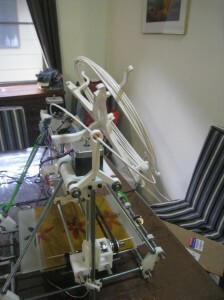 Last week, when I was having ‘shelling’ (actually backlash) issues, I made a post to the Reprap forums. One of the posters there suggested that a way to correct the ‘wiggles’ in the walls of my prints was to change across to the Marlin firmware. This is a pretty radical suggestion, as Sprinter is currently firmly entrenched as the favorite firmware of the Reprap community. But, given that changing firmware is pretty much the easiest thing you can do with your Reprap, I thought I’d give it a shot. Configuration was easy, Marlin uses exactly the same configuration.h file as Sprinter, so all the settings can carry through. One point of note; the Marlin firmware runs at a standard 250,000 baud rate, as opposed to Sprinter’s 115,000. The only trickiness with the firmware was the thermistor tables. Marlin didn’t have the thermistor table for my hot-end, but that was just a simple copy-and-paste job across from Sprinter’s thermistor.h. Once uploaded, WOW, the difference is impressive. You can hear the difference in the motor control. Much smoother and more finely controlled than Sprinter. The printer is now exceptionally quiet. It was pretty noisy when I had Sprinter and the PLA bushings, but now with the linear bearings and Marlin, it’s super-quiet. No problems watching the TV with the printer running away behind your head. It’s probably due to the greater stepping control and better acceleration. Less ‘jerks’ on the axes. The print quality has improved again. One of my banes – non-completely-filled top surfaces – has almost been eliminated. Surface finish is much better, as is layer stacking. Next on my list of ‘things to work on’ will be to try and figure out how to shut down the heatbed and hot-end after a print. I’m now confident enough with my printer to leave it running unattended (once I get the spool printed for filament feed), but I want it to shut down when I’m finished. I think this can be done by adding the right G-codes to the end.gmc file, but I need to investigate how to do that. Solid infill, particularly on ‘top’ layers. 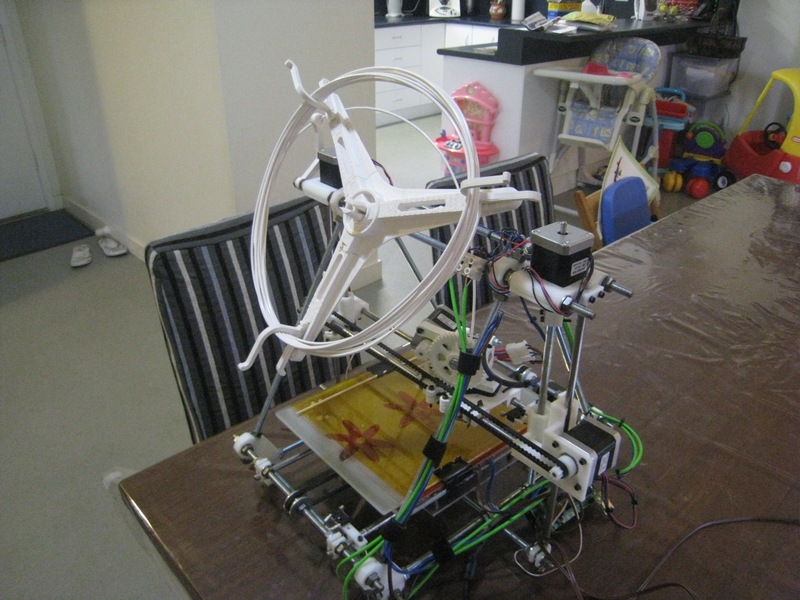 This entry was posted in reprap and tagged firmware, marlin on November 15, 2011 by David.